Carroll County’s Kay Sedlak shares her green thumb! 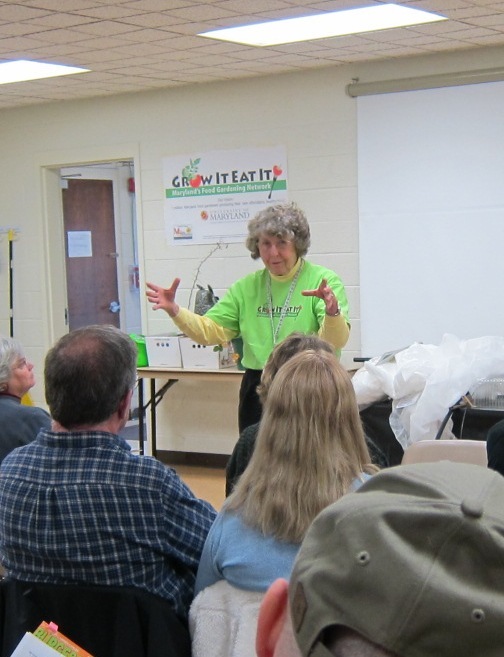 Master Gardener Kay Sedlak shares her wealth of expertise and and a lifetime of experience on “Extending the Gardening Season” during the continuing GIEI Classes being held at the Carroll County UM Extension. In addition to sharing her “green thumb” with the public, Kay leads the Heirloom Garden at Carroll County’s Farm Museum. Additionally, Sue Parks & Judi Johnson taught participants skills in growing herbs and Joan Epler led a discussion on growing small fruits. Lastly, Chef Henry Lysy prepared and shared a fantastic spinach & basil pesto. This year’s courses are again a great success with 50+ attendees each week. The group has another learning event scheduled for this Saturday January 21, 2012. Course content includes starting seeds, container gardening and back yard composting. Congrats to a great team and wonderful audience.